Pieter Jansz. Saenredam, Dutch (active Haarlem and Utrecht), 1597 - 1665. Figures attributed to Pieter Jansz. Post, Dutch, 1608 - 1669. The church of Saint Bavo dominated the Dutch city of Haarlem in the seventeenth century; its tower was the highest in the city, and prominent local burghers were interred under its floor. Pieter Jansz. 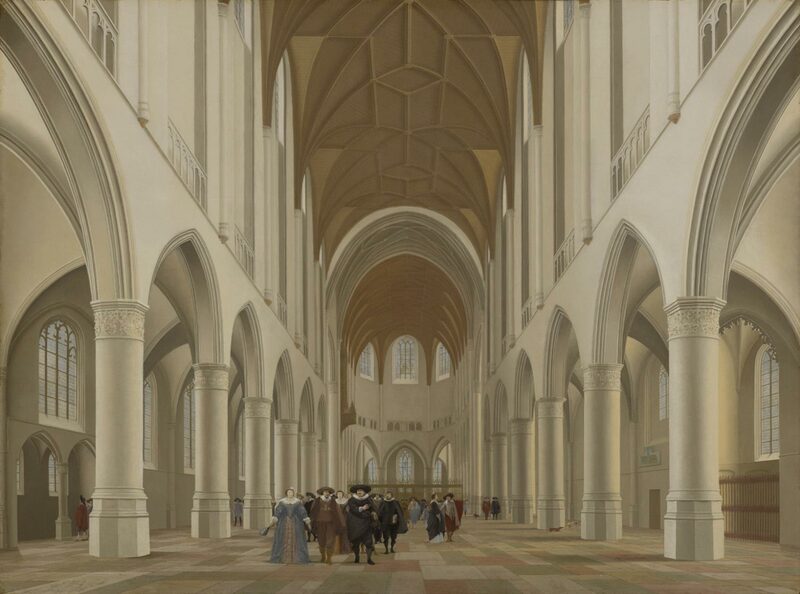 Saenredam, the foremost architectural painter in Holland, had studied the mathematical science of perspective, and utilized the actual measurements of the church in composing this painting, the earliest and one of the most celebrated of his many images of Saint Bavo. Because of its technical difficulty, architectural painting appealed to patrician patrons such as the wealthy burghers here taking a tour of the church. At middle right, a man points to a painting of Saint Bavo that in Saenredam's day was thought to have been the work of Haarlem's greatest fifteenth-century artist, Geertgen tot Sint Jans. By including Geertgen's view of the church in his own painting, Saenredam attests to both his own exalted lineage as a painter of architectural images as well as his ability to surpass the achievements of his forebears. Katherine Crawford Luber, from Philadelphia Museum of Art: Handbook of the Collections (1995), p. 173.